An unimodular matrix is a square matrix with integer entries such that its determinant is either -1, 0 or 1. A matrix is said totally unimodular (TU for short) if all its square submatrices are unimodular. Sometime ago, we said that problems such as the minimum path, maximum flow and minimum cost max flow can be modeled using linear programming with the interesting property that the optimal solutions are always integer. Theorem 1. Let be a totally unimodular matrix and be an integer vector. Then, the polyhedra has integer vertices. In this post we’ll present some properties of TU matrices and discuss about two simple examples. Its transpose, , is TU. Using this properties we can get some Corollaries from Theorem 1. Corollary 1. The polytope has integer vertices. Corollary 2. The dual of , namely has also integer vertices. Theorem 2. The incidence matrix of a graph is totally unimodular if and only if, is bipartite. This result can be used to derive the König-Egerváry theorem, stating that the maximum cardinality matching and the minimum vertex cover have the same value bipartite graphs. If the graph is bipartite, we can use Theorem 2 and the strong duality for linear programs to conclude that (1) = (2). Theorem 3. The incidence matrix of a directed graph is totally modular. Consider a network represented by and with capacities represented by . For each directed edge , let be the flow in this edge. which are the flow conservation constraints. Since is totally unimodular, then if is integer, it’s possible to show that the polytope has integral vertices. This polytope also represents the constraints of the max circulation problem. We can see that the constraints matrix of the above formulation is a submatrix of the max circulation problem and by Property 3, it’s also TU, which in turn means the corresponding polytope has integral vertices. In this post, we introduced the concept of total unimodular matrices and presented two simple examples: the incidence matrix of a bipartite graph and the incidence matrix of a directed graph. 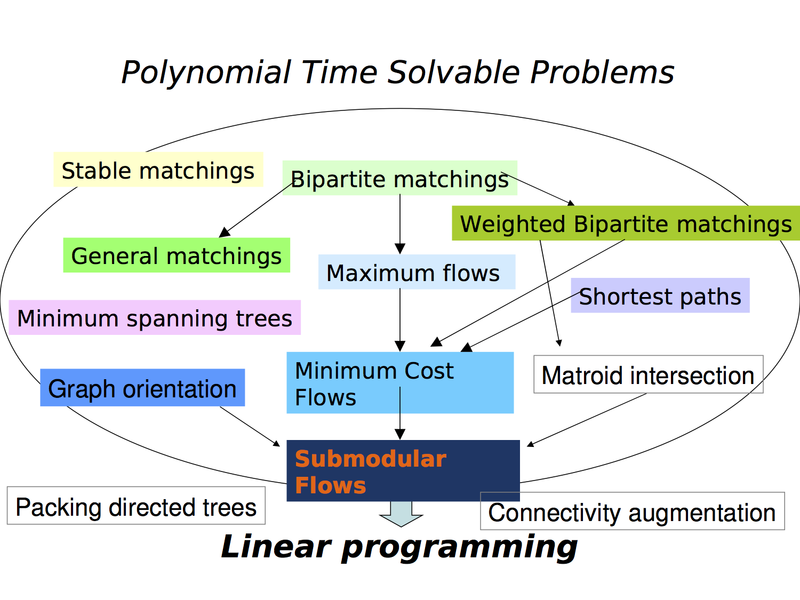 Here’s a cool chart of common polynomial time solvable problems organized by their generality . In future posts, we’ll keep exploring this subject by studying other examples and properties of TU matrices. This entry was posted in combinatorics, integer programming, linear algebra, math. Bookmark the permalink.